Did you know that organic farmers use pesticides? They do. Would it surprise you to know that many of the same pesticides are used by both conventional and organic farmers? 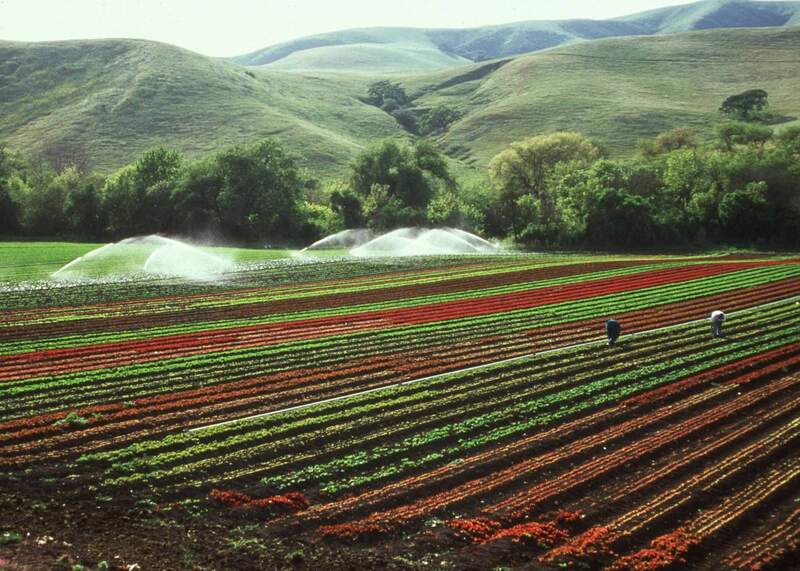 In fact just over half of all the pesticides used in California by all categories of farmers are active ingredients that are approved for organic. Would it surprise you to know that very little of modern pesticide use involves highly toxic chemicals? 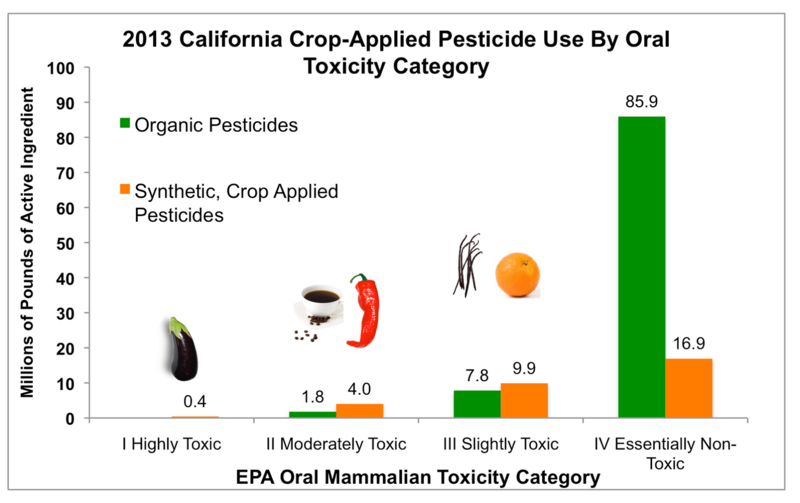 In fact the organic-approved and synthetic pesticides used in California today have a similar distribution of relative toxicity—mostly at the low toxicity end of the spectrum. This sort of useful information is publicly available, and is helpful in addressing many common misperceptions about organic and about pesticides in general. Click image for larger version. 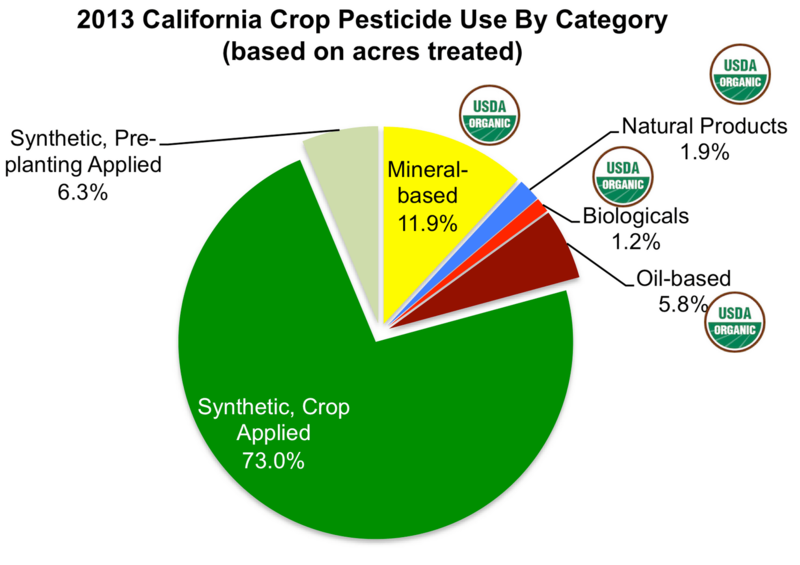 Of 171 million pounds of pesticides used in California crop agriculture in 2013, this is the breakdown by type. In the graph above I’ve broken out the 2013 California pesticide use by major categories based on pounds. 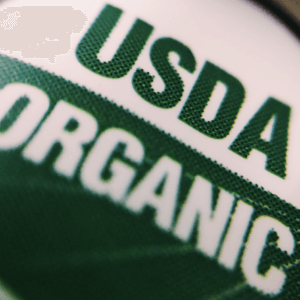 The categories that have organic-approved active ingredients are indicated with the USDA logo and together these comprise 55 percent of the total pounds applied. These materials are extensively used by both organic and non-organic growers. The conventional growers have additional options, but definitely use some of these same materials as part of a resistance management strategy and for other practical reasons. 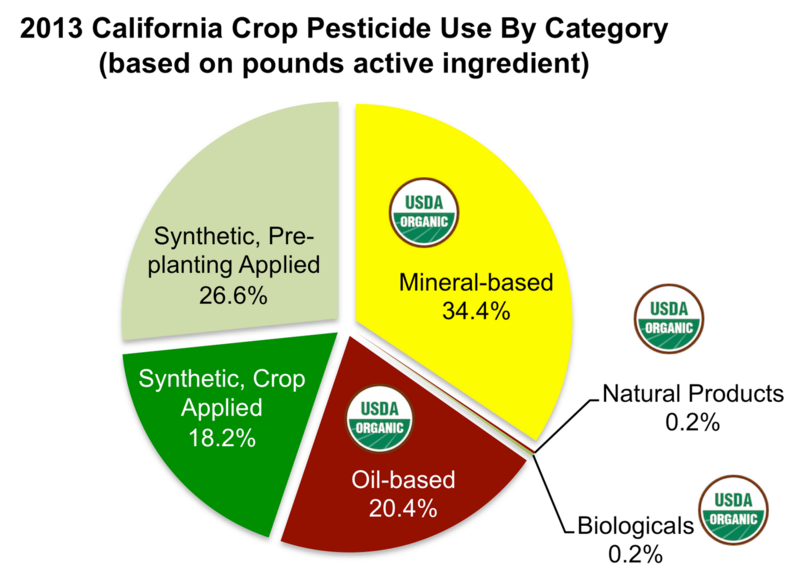 The mineral-based pesticides include the fungicide/miticide—sulfur, which is the most heavily used pesticide in California by a wide margin (27.6 percent of all the pounds). Sulfur has been used by farmers since ancient times. Other organic-approved, mineral pesticides include lime sulfur, and several different forms of copper. Copper fungicides were discovered in the late 1800s and saved the grape industry in Europe from a disease introduced from the new world. On the whole, these mineral-based pesticides tend to be high use rate materials (2 to 10 to even 25 pounds/acre/application). Thus the minerals only account for 12% of the area treated (see graph below). The synthetic pesticides are divided into two major use patterns – materials that are applied as soil fumigants several weeks before the crop is planted (26.6 percent of the total pounds, 6.3 percent of the area) , and materials that are applied to existing plants (18.2 percent of the total pounds and 73 percent of the total area). Consumers typically worry about the potential toxicity of the pesticide residues on foods they consume. In fact, the pesticides in use today have very low acute toxicity (see graph below). On the figure above I’ve included pictures of familiar foods which contain natural chemicals we enjoy which fall into each of these categories of intrinsic oral toxicity. The largest proportion of both organic and synthetic pesticides are in a category with essentially no toxicity of this type. The next most frequent category has slight toxicity — in the same range as vanillin or citric acid. A smaller subset of both organic and synthetic pesticides are “moderately toxic,” but so are the plant-made pesticides caffeine and capsaicin. Only 0.2 percent of what was used on crops in California in 2013 falls into the “highly toxic” category, and products like that are limited to timings that ensure minimal residues remain by harvest. That said, several crops including eggplants, cauliflower and tomato contain low levels of nicotine – another plant-made pesticide which would fall into the “highly toxic” category if it were a commercial product. So overall, in terms of basic toxicity by ingestion, the range and distribution is similar for the organic-approved and the synthetic pesticides used today. The pre-planting synthetic fumigants mostly fall into Category II, but they are no longer present by the time the crop is growing. 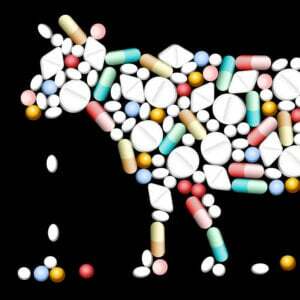 The reason that consumers can be confident that their food is safe is really the same for organic and conventional. 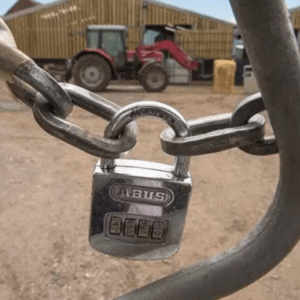 The products that are allowed are rigorously evaluated, and the details of how they can be used are set through “label requirements” regarding worker safety, restrictions around sensitive habitats, rate and timing limits, and the time allowed between the last application and harvest. Those restrictions (which exist for both organic and synthetic pesticides) are designed to ensure that any residues at the consumer level are well below a very conservative threshold called a “tolerance” in the U.S. and MRL (maximum residue level) in other countries. In the U.S. and Canada respectively the USDA and Health Canada take random samples of foods from the commercial supply and test them in labs for the presence of pesticide residues. What they find is very encouraging and should give consumers considerable confidence (this independently developed website allows you to visualize this public data source). Interestingly, this testing does not include a look at the highest use-rate organic-approved pesticides (sulfur, petroleum derived oils, copper compounds). To do so would require an additional testing regime at considerable cost, and the materials are not considered to be of sufficient concern to warrant that. So in conclusion, pesticides are definitely used on organic crops. Organic and conventional growers use many of the same chemicals. For the organic and synthetic pesticides in use today there is a similar distribution of intrinsic acute, oral toxicity. Consumer confidence in this area can be based on highly transparent sources of data and on the legacy of decades of environmental campaigning, decades of increasingly rigorous regulation, and billions of dollars of investment in finding better and better options for pest control. You can find a more detailed description of some of these pesticides and their use in a related post on Steve Savage’s Applied Mythology blog.